During the chaos that accompanied the last few months before Stax finally imploded Truth was the only real outlet for the music the organisation was still making. Several very good records got lost in the shuffle then including two wonderful Shirley Brown cuts, "It's Worth A Whippin'" and "It Ain't No Fun" and Frederick Knight's gorgeous "I Betcha Didn't Know That". In amongst those that never did as well as they should have was the only 45 Willie Singleton ever cut. Although he had been hanging around at Stax for some years he had to wait to 1974 for his chance. 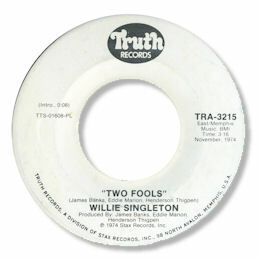 "Burning On Both Ends" has had some dancer attention but the deep Two Fools knocks it into a cocked hat. The song has some strong chord changes and a careful arrangement typical of early 70s Memphis. And despite reports that he couldn't stay in key Willie sounds pretty good to me - with a high baritone voice showing a good sense of dynamics and a good gruff tone when he wanted, with a feel not unlike Randy Brown.